Lactose is a disaccharide (12-carbon) sugar that occurs in mammalian milk. 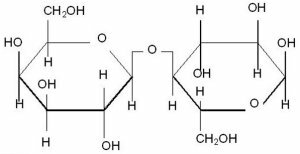 It consists of a molecule of glucose and one of galactose joined by a glycosidic bond and is broken down into these simple sugars by the action of the enzyme lactase which is secreted in the small intestine. Human milk contains about 6.7% lactose; cows' milk about 4.5% lactose. It exists in milk at body temperature mainly in two tautomeric forms (α and β) in approximately the proportion 2 to 3. People with lactase deficiency have a reduced ability to digest lactose – a condition known as lactose intolerance. In rare cases, lactose intolerance may occur in someone who is not deficient in lactase. Lactosuria is the presence of lactose in the urine. This often occurs during pregnancy and breast-feeding or if the milk flow is suppressed. Lactose is important in cheese-making, when lactic bacteria turn it into lactic acid, so souring the milk in the production of cheese curd. Lactase is an enzyme, secreted by the glands of the small intestine, that converts lactose (milk sugar) into glucose and galactose during digestion. Lactase deficiency is a condition in which the enzyme lactase is missing. It results in a reduced ability to digest lactose. Lactase deficiency may be present at birth, may develop immediately after weaning, or may not become evident until puberty or later. Congenital lactase deficiency is sometimes permanent but is more often temporary. It is caused by delayed enzyme maturation, and occurs especially in premature babies. Permanent lactase deficiency develops in about 80 to 90 percent of blacks and Orientals and in about 15 percent of whites. Lactase deficiency may also occur as a complication of intestinal diseases (including celiac disease and gastroenteritis); in such cases, the deficiency often disappears as the disease improves. Undigested lactose ferments in the intestine and causes severe abdominal cramps, bloating, flatulence, and diarrhea; weight loss and malnutrition may also occur. The diagnosis can be confirmed by tests on blood and feces. Treatment is a lactose-free diet; milk must be avoided but fermented milk products, such as yogurt, can be eaten. Enzyme replacements (which break down lactose either partially or fully) may be used in some cases.